Thousands of people in Iceland own horses for the simple pleasure of riding out and enjoying the companionship of their horses. Travel on horseback is growing in popularity and Icelandic horsemen are respectful and considerate when it comes to nature, just as they are with their horse. All sorts of competitions are on offer and everyone can find a level that suits them, from novice fun classes up to top class national competitions. The Icelandic Horse can be used in all the traditional Icelandic disciplines as well as in classic equestrian sports such as dressage and jumping. Whatever your preference – you will always find an Icelandic horse to fulfill your dream! The history of the Icelandic Horse can be traced right back to the settlement of the country in the late 9th century. Viking settlers brought with them their best horses, from various origins, though mostly of Germanic descent. Some sources say that the Icelandic Horse is a descendant of a Northern European breed, “Equus Scandinavicus”, while others claim that the horse is closely related to the English Exmoor pony. Although the origin of the breed was mixed, today this is one of the most purebred horse breeds in the world, due to its isolation. The breed has remained pure for over a thousand years and thus today there is only one breed of horse in Iceland – The Icelandic Horse. Raising horses in this manner, in herds that roam free in wide open fields and highlands, is the key to shaping the personality and character of the Icelandic Horse. Since the breed has been isolated in Iceland for a thousand years none of the major infectious horse diseases are found in Iceland. The Icelandic Horse is unique amongst horse breeds because it masters five gaits; walk, trot, tölt, canter/gallop and flying pace. The masters five gaits; walk, trot, tölt beat smooth gait, the “tölt”, that is very comfortable for the rider and elegantly displayed by the horse. It is an unforgettable experience, riding a horse that is so connected to the nature and landscape and where you can climb mountains, gallop across fields, cross rivers and enjoy the bright Icelandic summer nights. Ielandic horses were first exported as working animals decades ago. They were used for farm work and mining and tens of thousands of horses were exported for that purpose. The 1950s saw the first exports of riding horses, and since then the Icelandic Horse has grown in popularity in Europe and North America. An international association of Icelandic horse owners, FEIF, comprises 18 member countries: Austria, Belgium, Canada, Denmark, the Faeroe Islands, Finland, France, Germany, Great Britain, Iceland, Italy, Luxembourg, the Netherlands, Norway, Slovenia, Sweden, Switzerland and the USA. 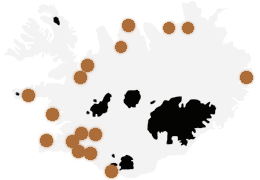 There are more than 100,000 Icelandic horses abroad, most of them in Germany and Scandinavia. The growing popularity of the Icelandic Horse has made horse breeding a valuable business and it has boosted the agricultural community in Iceland. sourcer:The Icelandic horse, published by The Horse Breeders Association of Iceland.